Beautiful home for lease in Briar Hills! There is beautiful tile and slate flooring throughout the entire home and because of that there is absolutely no carpet! The huge family room has soaring ceilings and surround sound. The family room is open to the study/workplace. The island kitchen has gleaming granite countertops and plenty of gray tone cabinets for tons of storage! The kitchen then leads to the dining area or study with soothing waterfalls which is perfect for entertaining in Briar Hills. 14311 Briarhills Parkway has a total of three large bedrooms plus a bonus family room downstairs. Additionally there is a game room and library upstairs. You can also retreat to your lush oasis like backyard with soothing waterfalls and disappearing fountains plus outdoor speakers. 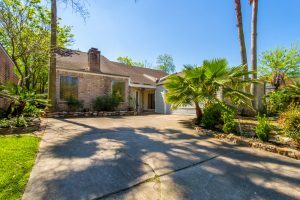 This great home is only steps from Terry Hershey hike and bike trails! Plus the Briar Hills community park and play area are nearby too. Read about the details on this home and see all photos. Are you thinking about buying or selling real estate in or around Houston? Then contact Connie Vallone with Park West Real Estate Inc. at (713) 249-4177 or connie@connievallone.com . You can also request a home valuation for your home or search for more available homes in the area.